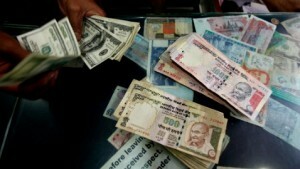 The Indian rupee has gained a solid 64 paise to 59.25 in early trade at the Interbank Foreign Exchange market. On Monday the Reserve Bank of India (RBI) announced a slew of measures to stem the steep fall of the currency. The measures announced by the RBI including hiking the lending rates for banks has helped, said forex dealers. The RBI raised lending rates to commercial banks by two per cent to 10.25 per cent making the loans more expensive. The rupee had lost 33 paise, the most in a week, to close at 59.89 against the dollar on Monday on fresh demand from banks and importers.